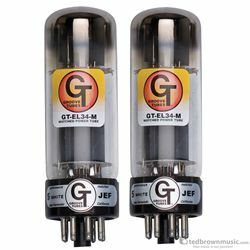 The GT EL34 is based on the original Mullard EL34 of the '60's - the stock tube in all early Marshall and Hiwitt amps. Mullard produced it for about 15 years, and this is a faithful reproduction of the classic XF2 dual-getter version. It has a big, fat and well-defined tone and really "wakes-up" reissue amps to perform like the originals. As close you can get to vintage Marshall power tube heaven.